Isn't it enough to just bake potatoes once? well sure, if they just have to be tender, but if you also want them to taste great, rebaked potatoes just have a bit more oomph. You simply take a baked potato and bake it gratinated/au gratin. Which you can do close to when they have to be done. They can also be made a day in advance without loosing any flavor, so they are excellent for guests. Makes 8 servings of ½ a potato per person. Cut an incision in the side of them, so that the steam can escape from the rind. Bake them for 1- 1 1/4 hours at 200°C (390°F). until they're tender. Let them cool enough that you are able to handle them. If they get completely cold, the potato "flesh " is harder to get out. Cut them in half on the wide side, so you get two halves that are as flat and wide as possible. Gently scrape the potato flesh from the potato skin, without destroying the skin. Save the skin, and put the flesh in a large bowl. Put in the rest of the ingredients and stir it all together. I personally like when the potatoes are a little lumpy, but that's your decision. Hands, a spoon or a mixer ... use whatever you want to mix it. Stuff the mixed potato mass back into the peels with a spoon. If you want to, you can put a bit of grated cheese on top of each potato. I do. You can now save the potatoes in the refrigerator for the next day if you prefer, or you can bake them immediately. Bake them for 20 minutes at 200°C (390°F). Until they are golden. 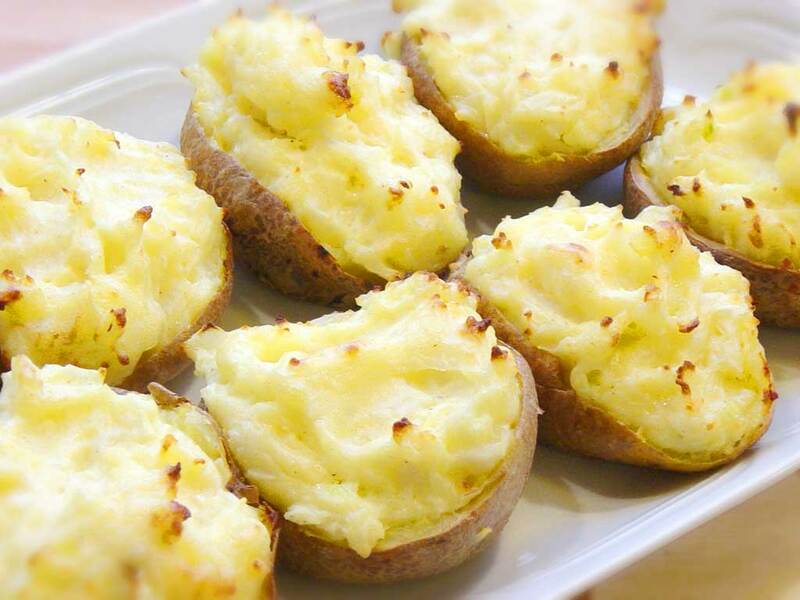 If you have leftovers of baked potatoes from another meal this is also a good "leftover-dish".